These are books I recently read. I love the George R.R. Martin saga (Song of Fire and Ice) and this is the eleventh I've read. I thought it was a bit long sometimes, but I still want to know what happens next. And it's beautifully written. The other book is from an Indian journalist and author and was an awesome read, thrilling and very interesting. (english title : Tarun Tejpal, the Story of my Assassins). The first one is about a hysterical woman who has a problem with her age. There were some good moments,here and there, made me smile. I wonder why my friend bought me that?? Should I feel concerned? 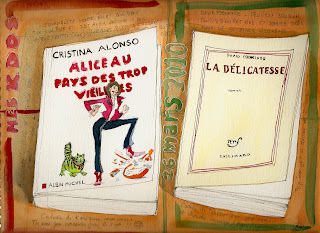 The second book is a love story, delicate, funny and surprising. I loved it. Author is Daniel Foenkinos, I don't know if he's been translated in English. The book is wonderful - I want to read the other ones now. I love your book reviews! And your drawings of the books are marvelous! Your book drawings are becoming legendary now Kazumi! I don't think I've seen people doing more book drawings ^^ I love how you drew the shadows and all. I am glad you enjoyed the little journey I prepared on my New "old" blog. The first one, the Joker, it was drawn on an office A4 paper before the movie came out using office ballpoint pens and markers, and highlighters ^^ I don't even know where I kept it. I think I might have shredded it away by accident. Super, de nouveaux bouquins pour ma liste. 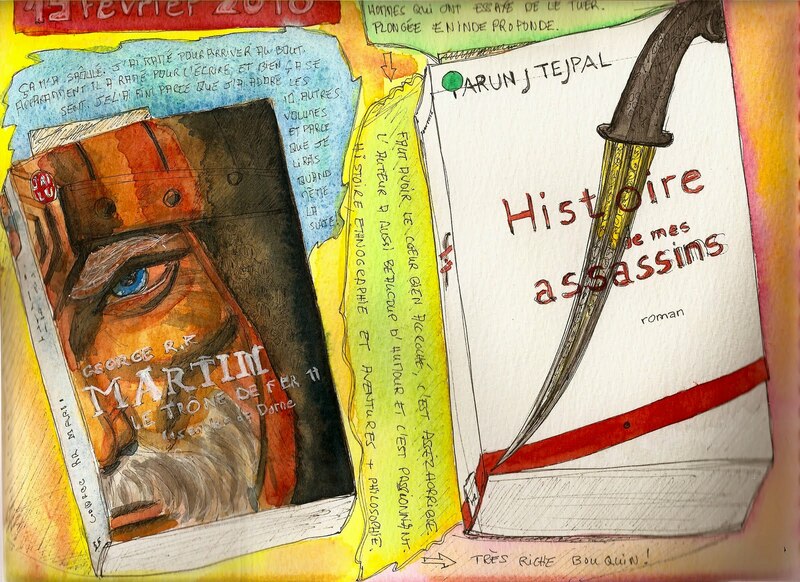 Tes dessins de couverture sont vraiment fantastiques et donnent envie de les lire. Tu devrais avoir une rubrique dans un journal! You've done a wonderful job on the books, which I feel are difficult subjects. These are terrific, kazumi! The drawings are great and so are the reviewss. This is a great idea. Excellent job! A wonderful way to do a book review. Great conversation and art. I love books too. These are wonderful sketches! I love your reviews and your sketches of books as well! I love these sketches and reviews, and makes me want to read more! La délicatesse has me interested, would you say that the French is difficult in this book? I haven't read French in a long while, but why not pick it up again (if I can find the book somewhere).